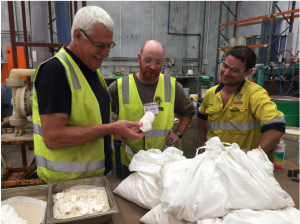 Major milestone achieved with production of Australia’s first field-evaporated Sulphate of Potash (SOP) from the company’s pilot processing facility at Canning Vale in Western Australia. 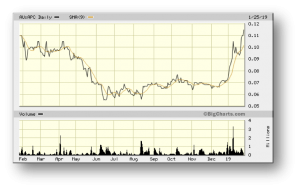 We introduced Australian Potash to our Watch-List Portfolio almost a year ago, based on the potential of its advanced Lake Wells Potash Project in Western Australia. A Scoping Study on the Lake Wells Potash Project was completed and released during March 2017, exceeding expectations and confirming that the project’s economic and technical credentials are all exceptionally strong. The study highlighted APC’s potential to become a significant long-life, low capital and high-margin SOP producer to both domestic and export markets. APC has also produced Australia’s first field-evaporated SOP at its Canning Vale pilot processing facility in Western Australia, a major milestone that’s exceeded expectations in terms of product purity. APC is now conducting a Definitive Feasibility Study (DFS) into the development of Lake Wells, which is targeted for release during H2 2019. Over the past three weeks, APC has achieved some major milestones that have enormous implications not only for the company, but the future of the burgeoning SOP industry in Australia – with APC at the forefront. 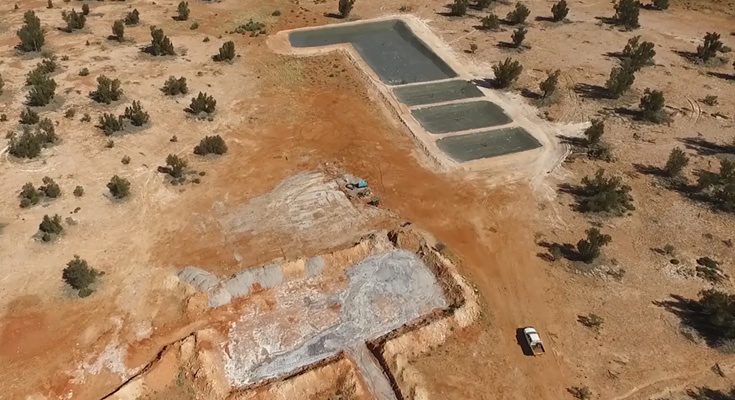 Back in late December 2018 APC advised that its Canning Vale pilot processing facility in Western Australia had received 3 tonnes of the final potassium rich harvest salts from its Lake Wells pilot evaporation program. This development set APC up for a major milestone, as it set the company up to become the first Australian producer of SOP from field evaporated salts. Just today, APC confirmed that it had produced Australia’s first field-evaporated SOP, exceeding even its own expectations in terms of product purity. Working to the flow-sheet designed by Novopro, preliminary analysis from titration indicates a 98% pure SOP equivalent to approximately 53% K2O. Image 1: APC Director Rhett Brans, Novopro Chemical Engineer Mike Morrison and Bureau Veritas Senior Metallurgist Jeremy Neal handle a sample of 98% pure K2SO4 produced at the pilot processing plant. One area of focus for APC’s project team over the past 12 months has been to develop and refine the site evaporation model. Understanding the chemistry of the salts that are produced through the natural evaporation cycle is crucial in terms of planning both the commercial-scale development and SOP processing strategies. APC has therefore reached an important milestone in its development plans. Having produced Australia’s first field-evaporated SOP, the company can now detail the chemical composition of the SOP it can produce – an enormous benefit in terms of negotiating with MOU off-take partners. Most important of all, APC has evidence to demonstrate that the salts it can produce at Lake Wells are of the highest quality. 2019 will be an exciting year for APC on several fronts, including the commissioning of a greenhouse SOP-MOP (muriate of potash) trial managed by the University of Western Australia’s world-class School of Agriculture and Environment. The trial will also be supported by field trials across at least five sites. MOP is the most concentrated form of granular potassium and typically the most cost-effective, so it will be an interesting comparison. The robust analysis will also test broad-acre crop yields and grain quality across several of the various Western Australian soil types. APC holds a 100% interest in the Lake Wells potash project, located approximately 500km northeast of Kalgoorlie in Western Australia’s Eastern Goldfields. On development of Stage 1, Lake Wells will comprise a 150,000tpa SOP processing operation, supported by a 35-bore brine abstraction network. APC’s aim is to develop Lake Wells at a cost that promotes SOP use over MOP to both domestic markets and markets in southeast Asia. Lake Wells has a logistical advantage over other projects due to its rail and port access, local government support and low-risk brine abstraction model, which should positively impact on operating costs. APC is currently focused on activities related to completion of a Bankable Feasibility Study (BFS) on its Lake Wells Potash Project. The resource at Lake Wells should comfortably support the planned 20-year operation (it utilises <25% of the current drainable resource), and given the aquifer type, should have good pumping characteristics as demonstrated by pumping tests to date. Just as importantly, the production of Australia’s first field-evaporated SOP at APC’s Canning Vale pilot processing facility is a major milestone that’s exceeded expectations in terms of product purity, thus demonstrating product quality to potential end-users.